When President Emmerson Mnangagwa made his debut foreign trip as Head of State and Government, his destination was South Africa. It was explained that this was because South Africa presently chairs the regional bloc, Sadc. Apart from meeting the then South African President, Cde Jacob Zuma, President Mnangagwa also paid a courtesy call on the then deputy president, Cde Cyril Ramaphosa. President Ramaphosa had assumed leadership of the ruling African National Congress three days earlier. President Mnangagwa had just also been sworn-in as Zimbabwe’s leader. 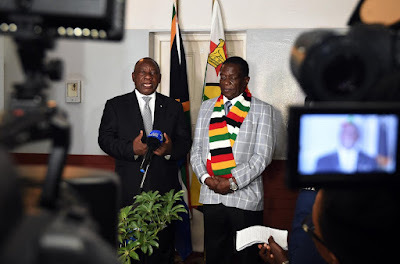 It was reported, during that brief meeting, that President Mnangagwa gave President Ramaphosa an indepth update on political developments in Zimbabwe. Zimbabwe had just undergone a political transition that witnessed the resignation of long-time leader Mr Robert Mugabe. President Mnangagwa was just beginning his regional whirlwind tour to explain the circumstances that led to the transition and to assure his counterparts that Zimbabwe was not only stable, but also open to doing business. In response, President Ramaphosa is reported to have expressed his eagerness to visit Zimbabwe as a guest of Zanu-PF before visiting other sister liberation movements in the region. As head of the ANC, President Ramaphosa was duty-bound to engage on a similar tour as President Mnangagwa’s, but as he was yet to assume state leadership, he would focus on meeting liberation movements at first. Now he is President of South Africa. And yesterday he met President Mnangagwa, the two meeting for the first time as leaders of their respective countries. A statement from the South African President’s Office said, “President Cyril Ramaphosa will undertake a working visit to the Republic of Mozambique and the Republic of Zimbabwe on 17 March 2018 as the Chair of the Southern African Development Community (Sadc). “The visit forms part of a long-standing tradition in the Sadc region, whereby newly elected Heads of State pay courtesy calls to the neighbouring countries. ‘‘During the visit, President Ramaphosa and his counterparts will discuss bilateral co-operation as well as regional, continental and global issues of mutual concern. While Presidents Mnangagwa and Ramaphosa “ran into each other” on the sidelines of the World Economic Forum Meeting in Davos in January, it was more of informal engagement.